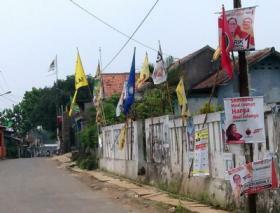 Indonesia’s parliamentary elections are on 9th April, with the first round of Presidential elections due on 9th July 2014 . There are close connections between disasters like floods, fires and landslides and the way natural resources are managed in Indonesia. The allocation of forests for commercial forestry, including logging, timber plantations, and for large-scale commercial plantations like oil palm and sugarcane; plus the clearing of forests for mining, is at the root of the deforestation that triggers such disasters. To make things worse for the poor, whose lives and livelihoods are most affected in disaster-prone areas, the climate impacts of deforestation and peatland clearing are increasing the likelihood of many of the severe weather events that are causing the damage. In 1997-98, Indonesia experienced the world’s worst forest fires, centred on Kalimantan and Sumatra. An estimated 1.1 million hectares of peatland was burned in Kalimantan alone during that period. Fires are burning in the region once again, following close behind the disastrous “haze” of 2013. In last year’s fires in Sumatra, especially Riau, fires hotspots were mostly located in timber plantation concessions belonging to the giant pulp and paper conglomerates APP and APRIL. Oil palm plantations are frequently the site of fires too: Riau also hosts Indonesia’s most extensive oil palm plantations amounting to 3 million hectares of Indonesia’s total 13 million hectares of oil palm plantations. In the run-up to elections, forests and mineral wealth and plantation land always become commodities which are traded for political campaign funds, votes and influence, whether this is at regional level for district head, mayor or governor, or at national level for parliament or president. According to Indonesian Corruption Watch (ICW), the forestry sector and other natural resources are truly fertile ground for securing political funding, for corruption and for getting rich quick. As of 2013, there were around seven cases of corruption in the forestry sector in the process of being dealt with, or already completed, by the Corruption Eradication Commission (KPK). Almost all these perpetrators of corruption occupied positions of power. Corruption in this sector not only leads to disasters which harm communities, but also bring losses to the state. A study by ICW into state losses in the forestry sector found that in the 2011-2012 period, these losses reached IDR691 trillion (around USD606 million). For some, it seems there is no hope for a change in forestry and natural resources politics in Indonesia, unless environmental activists enter the political arena themselves. Several environmental and indigenous activists have started to do this by putting themselves forward as potential members of the legislature for the coming period. These include Berry N Furqan the previous National Director of WALHI, Mahir Takaka, ex Deputy of the Indigenous Peoples Alliance of the Archipelago (AMAN), Ridha Saleh Ex Deputy of WALHI and former member of the National Commission of Human Rights. It remains to be seen how these pro-environment and pro-rights candidates fare in the elections and, if they are successful, how far they will be able to make headway on ecological justice after the vote. WWF dan LP3ES. Survey Persepsi Masyarakat Terhadap Isu Lingkungan dan Preferensi Partai Politik. 2014. ICW. Korupsi Kehutanan dan Korupsi Politik. 2014. Detik.com. 22 Juli 2013. ‘Aktifis Lingkungan Hidup di Sumsel siap Dukung Caleg yang Go Green’. Websites such as www.jariungu.com, http://www.checkyourcandidates.org/, and http://bersih2014.net/id/content/daftar-caleg-bersih-2014-serta-cv are providing information about candidates.